I opened this card 2 months ago with a 400 deposit it was just reported to the credit bureau and lowered my score by 26 points I pay my balance in full and use less than half of my credit line this is horrible ! You should only use up to 30% of your available credit, even less if possible. This card is an excellent tool for rebuilding credit or beginning a history of credit. I was approved with only a deposit of $99 (My credit score was 525 at the time) I have been using this card for two months and paying the balance in full at the end of each billing cycle and my score has already improved by 25 points. With the deposit being refundable at cancelation I highly reccomend this card. 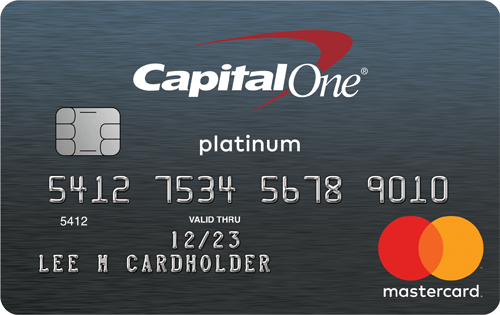 After 18 months of using the card, I learned Capital One does NOT report to credit bureaus so buyer beware. Sounds like an error. They definitively report. It's shown up on Credit Karma and the experian app that i use since it was reported last month for me. I have used this card for only two months and can say that Captial one has already reported my payment history to the credit agencies. They most definitely do report to the credit bureaus so I would call them and see if they can look into it. Definitely an error. They took $200 and sent me a card. I called to activate the card only to find out it had been canceled right after they mailed it. Here we are 3 months later and I haven't received my $200 back. This is a scam to hold your money for months. Don't dare apply nor trust them with your money! I love this card , I’ve had it 9 months only increases to 500 . I wouldn’t suggest it not because upon talk to a rep last night they do not unsecure secures cards anymore so literally I will forever have a 500 cc or I would have to close the account. What do you mean you will forever have a $500 cc? I'm sorry I just want to make sure I understand before applying for a card. That’s exactly where I am at... they NEVER told me that they wouldn’t make it unsecure later on until I asked .. so that made me irritated 1 year later I applied for discover and right off the back I got 1500 cl.. so I’m literally trying to pay off this card and cut it or wait for it to exspire in 2021 because this card will forever stay at 500 totally not worth it!!! The purpose of the secured card is to build your credit so you can get the unsecured card. Congratulations on doing just that. It looks like the card did what it was supposed to do. You could always do a balance transfer with a 0 interest card then close the secured card. You no longer need it. My credit score was in the low 500s... around 507. I just got this card a month ago, with a $200 deposit. I immediately spent about $50 filling up my Jeep and haven't touched it since then (keeping the credit utilization below 30%). I just checked this morning and my credit jumped up 65 points with Transunion, and 49 points with Equifax. I haven't even paid my first bill yet! I plan on paying my first bill early and entirely. Hoping to have above a 700 before the end of the year. So happy I made this move with the Capital One Secured Credit Card. Best decision I have made in years. Even though you don't know me from Adam, I'm so proud of you! That is awesome! Mine is about 505 right now with my student loans current but i have medical bills that im working on paying that are in collections right now so those are holding my credit back right now. After reading your review as well as others, i decided to go ahead and apply and I GOT APPROVED with a $200 deposit. Hoping this will help since i have nothing else at all in my name. I have had my card since last summer, and called and written to Capital One but they are still not reporting it so it's having no impact on my credit. Which was the sole reason I got the card in the first place. I really hope I get the help needed to resolve this asap. There are other good things I could write about the card, but without it being reported to help with my credit it's moot. Let us know what they say and if they report it for you. Did you say try checking your credit score from a different site? Maybe there's something wrong with credit karma. It's just a thought. Idk if it will be helpful but I just thought about it and wanted to let you know. I had a very low credit score. I went from 520 to 585 in a few months. I have one more payment to make and my limit will increase to 500 from 300. Great card I think! I want to tell you about my story before you get this card. I was approved and had to make a deposit of $49, which I did. I received my card and activated it. I was being responsible and added my bank information so I could make a payment before it was due. There was no copy and paste option, so of course, there is room for error on the app. I tried to make the payment and since I entered a number wrong, the payment was returned, once. I immediately went to change it and correct it. Well, one payment was returned and they closed my account. My bill wasn't even due until 4 weeks later and because I entered one number wrong, my account was closed. I didn't even get a chance to fix anything. They said they closed the account because of too many returned payments. Excuse me, what ? One returned payment and because there was no copy and paste option, of course people will make mistakes.!! This messed my credit up worse than before. Makes me so angry that they did that to me. Don't get this card !! And if you do, be careful. Make no mistakes !!! This card is great! I've had it for 4 months and no issues. All you have to do is triple check entered information before you proceed. It's really easy to avoid the issue you had. It's a secured card for a reason. Similar thing happened to me. They said I enetered my payment info in wrong. But in all actuality they didn't except the type of card I was using for payment. After 2 returned payment I asked do they except my payment type (American Express Bank card) they said yes . Tried to pay again it returned after saying it went through. So I switch to paying it through my regular bank account it went through but they already started the closing process so nothing they could do to reverse that. Had the card for over a year wife was paying it prior to myself and good pay record up until those 3 returns and they still closed it.